It’s National Pretzel Day! Make These Alton Brown Soft Pretzels! Since there seems to be a day for just about everything you can make or cook these days, I shouldn’t be surprised that it is National Pretzel Day today. There is nothing like a soft pretzel when you want a tasty snack. One of my favorite memories of all-time is getting a hot pretzel on the streets of New York City or just outside of Shea Stadium when we would go to see a ballgame. Guys would heat them right in a shopping cart and while it may not have been the most sanitary thing in the world, the taste and the smell were fantastic. 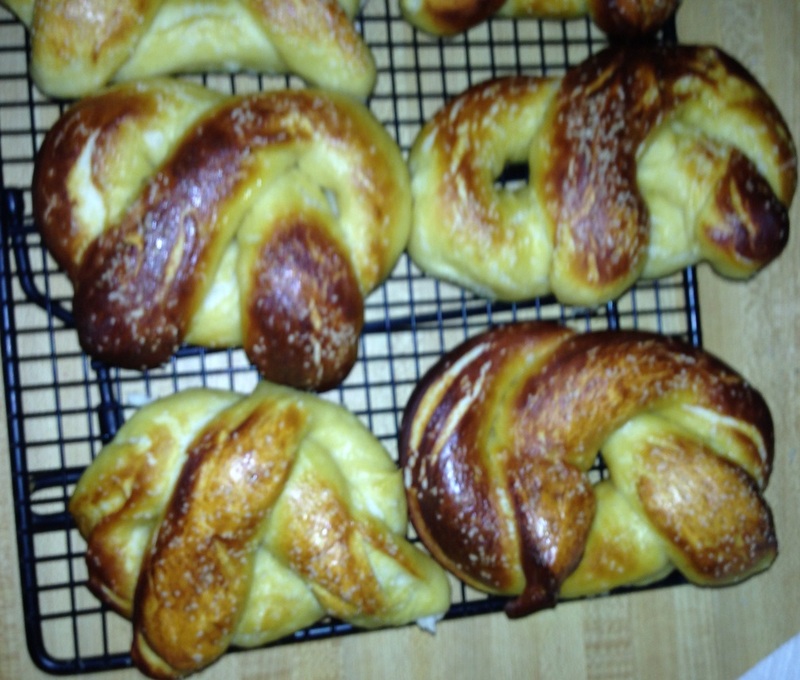 I have made soft pretzels before, but when I saw this recipe from Alton Brown it sounded easier than what I had done in the past and they looked great, so I had to give them a try today. Combine the water, sugar and kosher salt in the bowl of a stand mixer and sprinkle the yeast on top. Allow the yeast to sit for 5 minutes or until the mixture begins to foam. Add the flour and butter and, using the dough hook attachment of your mixer, mix on low-speed until the dough is well combined. Change the mixer to medium speed and knead until the dough is smooth and pulls away from the side of the bowl, approximately 4 to 5 minutes. Remove the dough from the bowl, clean the bowl and then oil it well with vegetable oil. Return the dough to the bowl, cover it with plastic wrap and sit in a warm place for approximately 50 to 55 minutes or until the dough has doubled in size. Preheat the oven to 450 degrees. Line 2 half-sheet pans with parchment paper and lightly brush the pans with the vegetable oil. Set the pans aside. In the meantime, turn the dough out onto a slightly oiled work surface and divide the dough into 8 equal pieces. Roll out each piece of dough into a 24-inch rope. Make a U-shape with the rope, holding the ends of the rope, cross them over each other and press onto the bottom of the U in order to form the shape of a pretzel. Place the pretzels onto the parchment-lined half sheet pan. Place the pretzels into the boiling water, 1 by 1, for 30 seconds. Remove them from the water using a large flat spatula. Return the pretzels to the half sheet pan, brush the top of each pretzel with the beaten egg yolk and water mixture and sprinkle each pretzel with the salt. Bake the pretzels until they are dark golden brown in color, approximately 12 to 14 minutes. Transfer the pretzels to a cooling rack for at least 5 minutes before serving. Wow, those were really easy to make and they taste fantastic! You can throw these together in under two hours and have a great snack anytime you want them for a party, watching the game or just because you feel like having them. Michelle, Sean and I loved them and we still have a few left over to enjoy tomorrow, if they last that long. I will definitely be using this recipe from now on when I make pretzels. I love pretzels, but then again living in Philly its kind of a requirement to love a good soft pretzel. this is a great recipe, thanks for sharing. Thanks! It’s true, you pretty much need to love pretzels there!